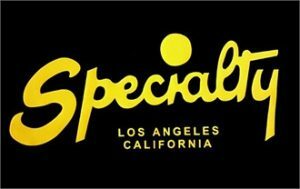 One of the longer lasting and most iconic independent record labels during rock ‘n’ roll’s rise to prominence was started in Los Angeles in 1946 by Art Rupe (b. Arthur Goldborough) who got into records only when he failed to crack the movie industry. 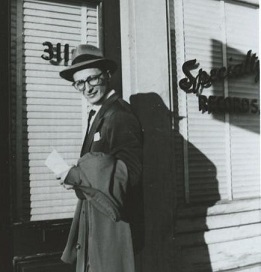 After losing money after investing in a local independent company called Atlas in 1944 he decided to start his own label and approached it in a scientific way that foretold of the demographic and market research that would become all too ubiquitous in later years across all forms of pop media. He dubbed the label Juke Box Records so as to indicate an appeal to that trade, then upon settling on making records for black audiences he spent most of his money on current records popular in that market and a stopwatch and he sat and listened to them all, breaking them down by lyrics, pace, instruments and time he pragmatically figured out a basic, if crude, “formula” for a successful record. Confident in his amateur research his first release “Boogie #1” (the term boogie being the most commonly use lyric in the records he studied) he wound up with a fairly big seller, giving him the capital needed to grow. But having taken on partners and then getting his first legitimate hit with Roy Milton’s “R.M. Blues”, one of the records most influential on rock’s emergence down the road, he broke off the partnership and was now oh for two when it came to building a successful career in the music industry. Undaunted he started Specialty Records and since he’d retained the masters of Juke Box Records he was able to continue to sell the hot sides of Roy Milton (following a brief departure by Milton to start HIS own label) and then he started his own distribution network to ensure his records consistently reached every market. For a novice Rupe managed to build one of the more impressive rosters of talent in black music – Milton and his moonlighting pianist Camille Howard appealed to the slightly older listener, adding Joe Liggins to that field at the dawn of the 1950’s; they featured gospel acts such as Pilgrim Travelers and The Soul Stirrers which provided consistent sales to that loyal market, and the for rock audience they had Jimmy Liggins and Percy Mayfield. As rock’s popularity grew and older black pop styles declined he shifted his focus more towards the younger audience who were now commanding a greater share of the attention, at first focusing on the talent from two areas, New Orleans with Lloyd Price, The Sha-Weez, Art Neville, zydeco master Clifton Chenier, plus an array of sessionists who cut sides on their own such as Roy Montrelle and Edgar Blanchard. The other hotspot was his own backyard of Los Angeles which produced Jesse Belvin, Marvin Phillips and Tony Allen. For someone who initially had expressed reluctance to let early signee Joe Lutcher explore rock music in 1947, considering it too wild, Rupe now specialzied – no pun intended – in the most manic artists rock had to offer with Don & Dewey, Larry Williams and the king and queen of that particular approach, Little Richard, who was Speciality’s signature star, reeling off a string of hits over three years in the mid-50’s which defined that era of rock ‘n’ roll. But Rupe had his blind spots too, which cost him dearly. First he discouraged Price from exploring a more poppish approach upon his discharge from the Armed Forces in the mid-1950’s following his early success with a more unhinged brand of rock. Price subsequently left the label and scored far bigger crossover hits in this watered down style by the end of the decade. His also lost Sam Cooke at the start of his solo career after Cooke left gospel behind, breaking off from the Soul Stirrers whom he’d led since 1951 to become a rock artist. Rupe, who initially had been cool towards the prospects of the 19 year old Cooke replacing the Stirrers legendary leader, R.H. Harris when Harris departed the group, now saw Cooke as his most reliable artist, guaranteeing each Soul Stirrers release would be met with broad sales. What he failed to grasp was that the should Cooke succeed at the transition to secular music he would have a FAR bigger market in rock. So he let Cooke walk in exchange for keeping royalties due him for the gospel songs Sam had written, only to see Cooke become a mega-star, first at tiny Keen Records, then at RCA, one of the original major labels. A failure to pay royalties also might have cost Rupe his biggest artist, as Little Richard, after being swayed by former Specialty act Joe Lutcher, now a devout Seventh Day Adventist (and perhaps still holding a grudge against Rupe for denying him the chance to kick-start rock himself back in the day), who convinced Richard to forsake rock ‘n’ roll for religion. How much an ongoing royalty dispute between the two parties had to do with it might never be fully known, but in the course of a year he lost both Little Richard and Sam Cooke with nothing to show for it. After Larry Williams frequent troubles with the law he too departed for other labels – not to mention jail – leaving Rupe with no hit makers as the 1960’s dawned. The label hung on for a few more years, even bringing back Little Richard in his first comeback to rock in 1964, along with Don & Dewey whose low sales had always belied their talents, but the magic was gone and Rupe sold his company rather than try and rebuild. Specialty Records may have only thrived for about a dozen years, but during that time there were few labels who were as successful and their legacy remains undimmed in the next century.